DataSourceID - points to the SqlDataSource control ID. DataTextField and DataValueField - point them to the respective fields of the data source. FilterFields - these are the fields from the data source that will be used for filtering the text the user types. Set them according to the data source and your UX preferences. Filter - set it to "contains" to enable generic filtering. 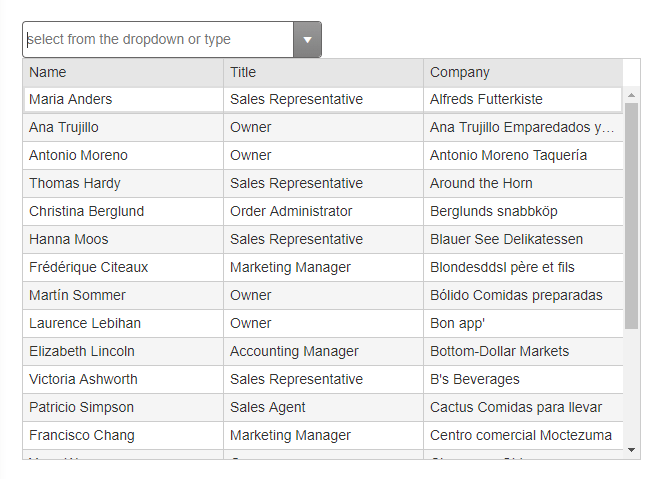 Placeholder, DropDownWidth, Height and Width control its appearance much like with other inputs and dropdowns. Field - the field from the data source that will be rendered. Title - the header text. Widthd - the width of the column. They should add up to the value of DropDownWidth.